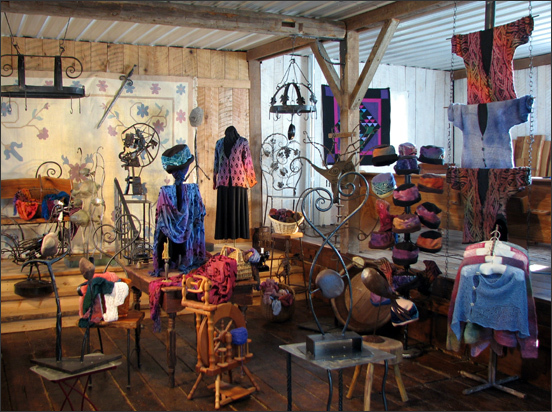 SteelWool Studio is located three miles outside of Waunakee, Wisconsin, on a dairy farm originally homesteaded in the 1890s. The stone and timber frame barn was the site of a double wedding when it was built in 1904. For the past thirty years the barn has been filled with rough-sawn oak boards harvested from the farm. We used this lumber to finish the interior walls of the studio, transforming our 36' x 60' dairy barn into various work and display spaces, keeping the original floors and beam construction. One side of the studio houses a 14-foot Gammill Optimum longarm quilting machine while the other side is for knitting and sewing. On the lower level, with the original field stone walls, is the painting and dyeing area and the site of Anne's dye and painting classes. For the past 25 years we have sold our work at art fairs across the country. Now, in our gallery, we have brought the art fair to you. Don will be offering an ever-changing array of items including plant hangers, kitchen pot racks, coat racks in walleye, bass, or muskie designs, a line of grape vine motif designs, key racks, stools, chairs, and hand-forged cork screws. Also for sale will be Don's current line of garden sculpture incorporating local fieldstone from the farm, as well as garden fish, turtles, sea gulls, ravens and the stone age man and woman. Anne will be offering a variety of hand-painted silk hats and scarves, hand-knit linen cardigans and shawls, ruanas and shrugs, painted wool sweaters and hats, as well as hand-painted fabrics and yarns. We have a great selection of handmade gifts priced under $50.